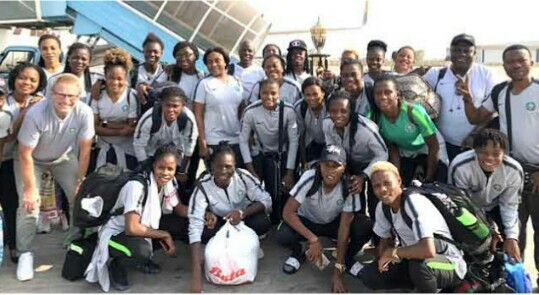 Nigeria’s female football national team, Super Falcons have returned to the country following their triumph at the just concluded 2018 Africa Women’s Cup of Nations (AWCON) championship. President Muhammadu Buhari's Chief of Staff, Abba Kyari, was at the head of a delegation of prominent Nigerians and top officials of the Nigeria Football Federation that received the victorious ladies on arrival in Abuja on Sunday evening. 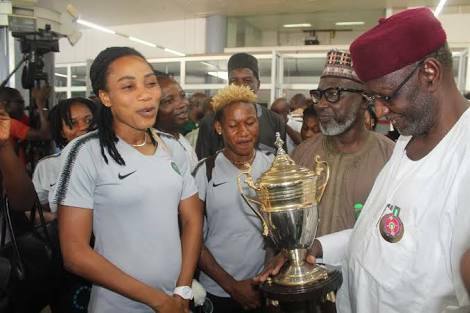 The nine-time African champions, flew into the Nnamdi Azikiwe International Airport minutes before 4pm, aboard an ASKY Airline flight from Accra, and were received by Kyari, NFF General Secretary, Dr. Mohammed Sanusi, as well as other officials of the NFF. On Saturday, at the Accra Sports Stadium, the golden girls prevailed over a resilient South African Banyana Banyana side 4-3 on penalties, after a scoreless 120 minutes, to lift the top African women football diadem for the third successive time and ninth time overall. “On behalf of Mr. President, who is not in the country at the moment, we say welcome and well done to you. 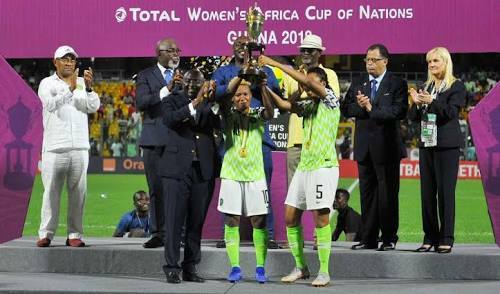 We are proud of you and your representation of the country.